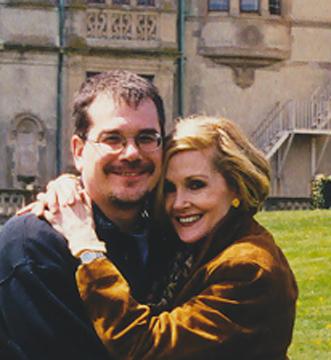 Craig Hamrick: What was it like working with Louis on Dark Shadows? Nancy Barrett: There were times when Alexandra (Moltke Isles) and I and Louis, as Uncle Roger, would have a three-person scene. And almost always, Alexandra and I could absolutely not keep a straight face. Louie was so terribly funny. And it happened at least once during taping... I think it ended with us both simply turning around. I mean, we turned out backs dead to the camera, because of Louie.... And of course the more we laughed, it just fed him. So, I really adored him and always had a terrible time playing scenes with him because he tickled me so. CH: What would he do? Was it the way he'd read lines? NB: That's the difficult thing (to explain). I'm not sure if it's evident if you don't know him. It may be one of those situations where you have to know the person and what he's really like, and it's kind of Noel Cowardian in a way -- that kind of grandiosity that is so funny. And then he played a kind of pompous, controlling fellow. CH: Do you remember when you first met him? Would it have been there on the set? CH: And then you were. NB: And then we were, instantly. CH: Did you take to each other right away and become friends? NB: This is going back a long way, and a lot has happened since then, but I'm sure that once we both discovered we were from Louisiana.... He was from Baton Rouge, and I had been born in Louisiana, and we were both Librans. We were probably felt that we were fated to work together. I don't think we saw it was going to be for five years, but.... And then we did another play together, much later. Did you know that? NB: Louie was doing a production of a Noel Coward play called Quadrille, which was, as he puts it, kind of an Autumnal Private Lives. And one of the actresses had, I don't know, gotten a job or broken a leg or something. And he said "Nancy, why don't you come and see if you have any interest in doing this?" And it was up at the York Theater. So I did, and that was fun. It was in 1979 or 1980. 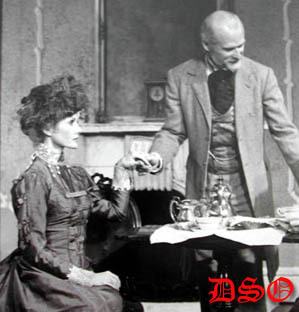 RARE Stage Photo: Louis Edmonds and Nancy Barrett on stage together in Noel Coward's Quadrille, a decade after being co-stars on Dark Shadows. CH: So, you saw him off the set, too? At least you went to the Rookery (his Long Island home) a couple of times? NB: Oh, yes, and it's a wonderful place. As you know, Louie is a fabulous host. I mean, he's really good at entertaining. He himself is entertaining, and he is interested in other people--what's going on with them. And he's just a terrific host. I don't have memories of things that happened on the set. I know that people tell a lot of stories. but when you're there, kind of day after day after day, in my mind, they start to blend together. As many people as I worked with during those five years, the only people to whom I could say I felt close and still feel some kinship with are Louie and Alexandra, whom I almost never see. She came to see me in a play and wrote me a really nice letter about it. And I spoke to her (answering machine), but we don't stay in close touch. I was very close to Grayson Hall, and Sam Hall, her husband. But they're the only people that I really saw after the show was over. But it's very common (in show business) to work with people very closely and very intimately and then never see them again. You see them on the street five or six years later, and you know that you know them, but you're not sure... And, I mean, you spent your life with them, day after day. CH: Was Dark Shadows different from other shows in that respect? You worked on a couple of other soap operas after that -- was there more of a closeness between that cast members of Dark Shadows, do you think? NB: I thought at the time it was very close. One of the reasons for that must have to do with how the show was produced as opposed to the way shows are produced today. The way (Dark Shadows) was done, we literally spent the entire day together. It wasn't that you rehearsed and did your scene and then you were gone, you know. We spent from 4:00 the preceding day, we rehearsed until 6, or 6:30, and then we began at 8:00 the following morning until the taping, at, I think 3 to 3:30. And unless an actor fell down the stairs and broke his neck, there was no stopping of the tape. They would stop for camera problems, but never for ORGANIC reasons. (She laughs). So, then if you were on the next day's show, you had a half hour and you started again. Also, as I recall, and this from Sam Hall, I think: They were limited to five actors per show. Now, that means that you're with a very limited number of people for very long periods of time. And also the scenes probably tended to be longer. I don't know because I have never in my life watched a soap opera. In fact, I don't watch daytime television. CH: That's probably true. I think that the pacing was a lot different then -- fewer commercials and that sort of thing. NB: So, the short answer to your question is to say, yes, it is unlike other soap operas in that way. The limitations in numbers in the cast, and the fact that it was taped continuously, all the way through. NB: Well, or terrific enmity. (She laughs.) The fact is, you're stuck with these people, there's nothing you can do about it. It's not like you go in and do your thing in an hour and (get out). We also played, as you know, different characters. That was the aspect of the show I really liked. I think I did a total of eight by the time the show went off the air. Louie did probably somewhere around the same number. We were like a little repertory company in that different people were playing with different actors and the relationships would be different. CH: I know this was a long time ago, but... Do you think Louis was different at the Rookery from the way he was on the set? Or was he pretty comfortable on the set -- pretty much himself? NB: I never saw Louie when I thought he WASN'T comfortable. I'm sure I'm wrong about that, you know. Because I was really young, so I was uncomfortable all the time! (She laughs.) Except when I was acting -- that part I really loved. But Louie... He was probably quite a lot more relaxed. CH: I interviewed one of the actresses he worked with on All My Children, (Rosa Nevin, who played his character's niece, Cecily), and she said that he was a real calming influence. In her early days, one day she had memorized the wrong script, and she was panicked when she realized that. And he calmed her down..
NB: Oh, he was very positive, very encouraging. 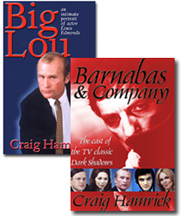 NB: What I took from Louie in those days was more personal. And in a way it's hard to put into words. I don't know that I can articulate it. It was not as simple as him being calming, because he was to me, I was just always glad to walk in and see him. (He) just kind of brightened the day. CH: That makes it fun to go to work. NB: Yes. It was still very early. (She laughs.) I mean, 8:00 in the morning is still very early.